The NFL didn't think referee Pete Morelli was good enough to officiate Sunday night's Colts-Steelers tilt, so they reassigned him and his crew to.... Patriots-Eagles! Oh boy! I can't wait to watch another horribly officiated game this weekend! The league reassigned Morelli's crew from the prime time game due to the amount of mistakes they made in last Sunday's 49ers-Cardinals match up. 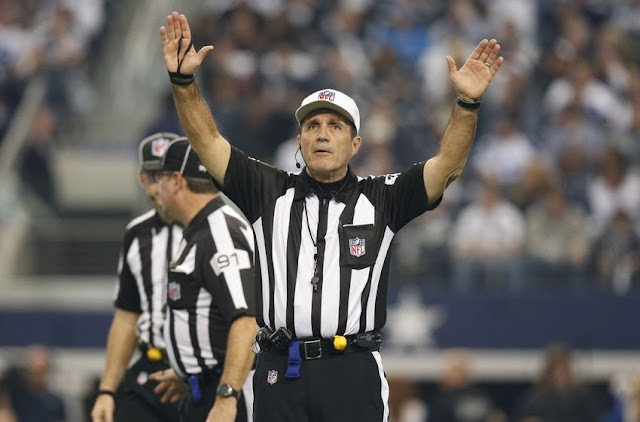 Morelli was also the official who picked up a flag for what was an obvious pass interference on the Dallas Cowboys in last year's Cowboys-Lions wild card game. So for the third week in a row, the Patriots will play in a game where the officiating will, in all likelihood, be questioned. At the same time, the opponent the Patriots will face this time around isn't as good as the previous two, so the referees may not have as much of a hand in deciding this one.